I have been spinning some yarn this summer (when I did not blog much). 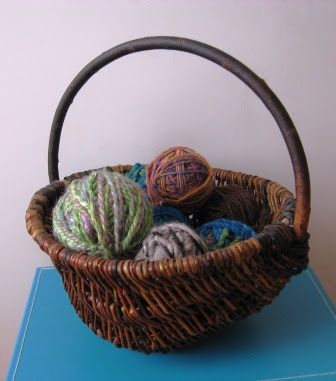 I have kept my small balls of singles and double yarn in this basket for a couple of months. My Dad, Don made this basket. I blog a fair bit about my mom's quilts but I thought I should show some of my dad's work. Dad is also a wood craftsmen. 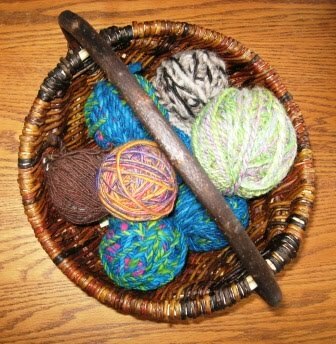 This summer my dad took a course on basket weaving. I teased him so much for taking basket weaving. At University, we would all call classes that are easy Basket Weaving. My dad has his PhD and answered "That when you have a PhD, you can take real Basket Weaving". Even with my teasing, I guess he thought I should have one of his baskets. I love it and thought my new yarn would look good in it. I keep it on the coffee table in the living room and have trained the dog not to steal them (he loves balls). So far so good. I got so many great comments yesterday about my Everyday Art Journal, thank you. It really makes me want to keep going. Add colour to a page and just right, then add an embellishment or two and your done. I have another page done but I have to retake the photo, I do not think I got enough light on it.